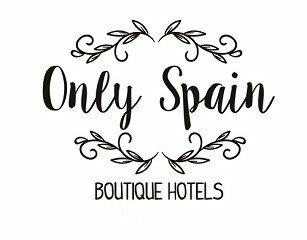 Spain is the country that originally introduced chocolate to the rest of Europe via South America thanks to its many jaunts there. 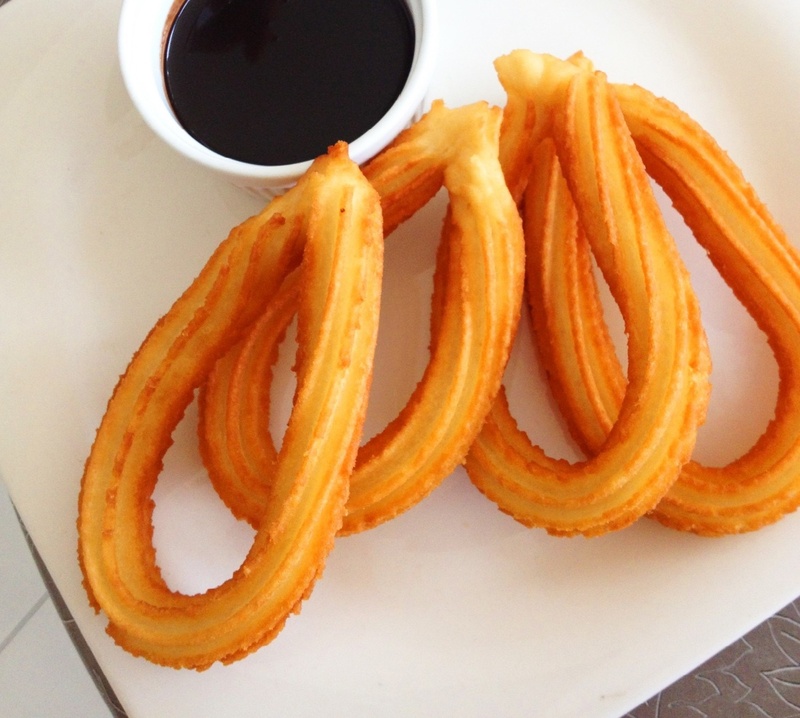 It may not be famous like Belgium and Switzerland and the chocolates they produce, but I'll give you one word that is synonymous with chocolate in Spain - churros. And churros and chocolate are a match made in heaven (to those with a sweet tooth) and the only way to eat this typical Spanish breakfast. It's a dough with which you use a special gadget, rather like an icing tube with a star-shaped nozzle, and you can make sticks or rings which are dropped into hot oil and fried then coated with sugar and dunked into a thick hot cocoa dip. A popular breakfast especially at weekends. I often see people carrying a big flat piped ring of churros home to share with family and friends. You can find chocolaterias and cafes which specialise in these for breakfast, the most famous is in Madrid - Chocolateria San Gines, which dates back to 1894 and is open 24/7, being close to the Puerta del Sol and Plaza Mayor squares it is never short of customers. Madrid's National Archaeology Museum has a chocolate section and there are several chocolate museums across Spain, such as in Barcelona near Ciutadella Park, in Astorga, León, Villajoyosa in Alicante and one in Sueca, Valencia near the Albufera Natural Park. Small businesses that produce their own chocolate are not rare either. 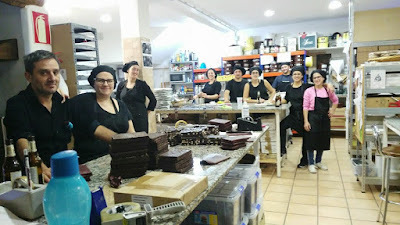 For a fun visit near the Costa del Sol try Mayan Monkey Mijas a chocolate factory and family firm in Mijas which not only makes various varieties of sustainably sourced chocolate but have workshops where you can make your own bars to take away, and dunk your fingers under the tap of pouring chocolate - you won't only do that once! To make churros dough, heat water, margarine and salt to rolling boil in 3-quart saucepan. Stir in flour. Stir vigorously over low heat until mixture forms a ball, about 1 minute. Remove from heat. Beat eggs all at once. Continue beating until smooth and then add to saucepan while stirring mixture. Spoon mixture into cake decorators' tube with large star tip. Squeeze 4-inch strips of dough into hot oil. Fry 3 or 4 strips at a time until golden brown, turning once, about 2 minutes on each side. Drain on paper towels. Dump the sugar on the pile of churros, like the pros. That churro taste will take you right back to your favorite summer days walking the paseos of Spain. Note: You can opt to mix cinnamon with the sugar before dumping it on the churros, but REAL churros in Spain are made without cinnamon. The cinnamon does add an extra nice flavor though. Place the chocolate and half the milk in a pan and heat, stirring, until the chocolate has melted. Dissolve the cornstarch in the remaining milk and whisk into the chocolate with the sugar. Cook on low heat, whisking constantly, until the chocolate is thickened, about five minutes. Add extra cornstarch if it doesn't start to thicken after 5 minutes. Remove and whisk smooth. Pour and serve in cups or bowls - for dunking churros. Do not pour over churros as it will make them soggy. Just dip the churros into the sauce before each bite.